When the half brother of North Korea’s dictator was assassinated in an airport in Malaysia this past February, it looked to the world like an amateur assassination attempt—the two women who smeared him with a deadly nerve agent wore conspicuous clothing, and neither they nor the North Korean operatives working with them bothered to cover their faces. Furthermore, they chose the busy airport in Kuala Lumpur where security cameras were trained on their every move. But that may have been intentional, a former member of South Korea’s intelligence agency said—it could have been a message to the world that North Korean leader Kim Jong Un is not to be messed with. Nam Sung-wook, a professor at Korea University who used to lead a research arm with South Korea’s intelligence agency told GQ that the public assassination of Kim Jong Nam was part of a five-year plot to kill the eldest son of Kim Il Sung. The assassination followed two other assassination attempts—one in 2010 and another in 2012—after which Jong Nam reportedly wrote his brother, asking him to withdraw the order to punish his family, saying, “We have nowhere to hide,” GQ reported. Nam had fallen out of favor with his father after he was caught in 2001 trying to travel to Japan to visit Disneyland on a Dominican Republic passport. 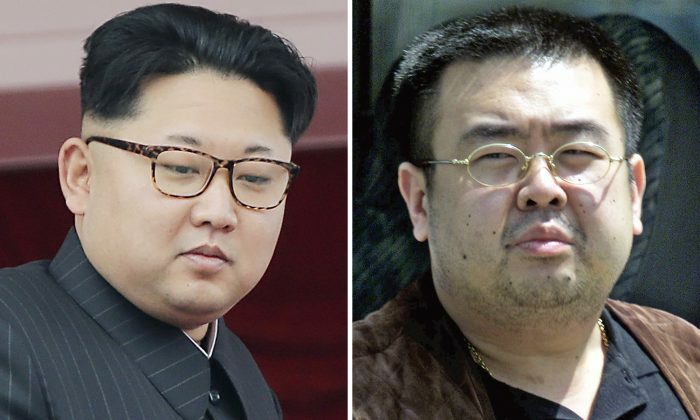 The youngest of the three Kim sons rose to power, and Kim Jong Nam was exiled. The North Korean regime maintains that Kim Jong Nam died of a heart attack. Kim Jong Nam was reportedly critical of his family’s iron-fisted rule, and eventually settled down in Macau, a former Portuguese colony that was ceded to China in 1999. While away from North Korea, he was never safe. As soon as Kim Jong Nam left Macau, he was followed closely by North Korean spies, Nam Sung-wook said, citing contacts in South Korea’s intelligence. “They had a group on his airplane. As soon as he arrived at the airport in Kuala Lumpur, another group followed him. They kept that surveillance up while he slept,” he told GQ. The two women who administered the parts of the VX nerve agent that together were deadly were from Vietnam and Indonesia, and their defense has argued they had no knowledge of the assassination plot. One of the women told friends she thought they were doing pranks for a TV show, (which they had been practicing for for weeks) and the women’s lawyers argue that the reason they washed their hands after administering the liquid was because they were told to. They are set to go before a judge in October. If convicted, they could face the death penalty.